I was born in Rome, Italy. Because of my dad’s job we moved around a lot. I moved to the States when I was 7 and grew up mostly in New York City and Chicago. I went to college at Georgetown University in Washington D.C. where I double majored in Marketing and International Business. My first year of college I fell in love with my husband Mark. We were 18 years old. We got married when we were 24. The day after our wedding we moved to San Francisco; without a job or a place to live. We were young, in love and unstoppable. Then, unexpectedly, at the age of 27 I got sick. I had no history of mental illness and within a few short weeks I spiraled into a deep depression and psychosis and found myself in the hospital for 23 days.When I first got sick Mark couldn’t find any article, book or website to help him process what had happened. That’s when he decided to write a memoir about our family’s journey and his experience as a caregiver. We hope to bring more understanding, love and compassion to an illness that has such stigma. Our book “My Lovely Wife” will be available in Australia on May 4th. It is also being published in the United States, Canada, U.K. and New Zealand this week. When I got pregnant Mark and I could not agree on a name. I went to every baby name website with no luck. Then one afternoon I was on a mission. I picked up my bag and went to a bookstore and sat there for 4 HOURS reading baby name books. Until I saw THE name on the page. It was JONAS. And it was a name that could easily be pronounced in both Italian and English but felt so unique and special. I didn’t know of any other JONAS. And I was immediately in love with the idea of him. Mark agreed. Jonas’ middle name is FINN. We have always been lovers of the ocean. My dad was a water polo Olympian and Mark has been a surfer since a young age. We knew our boy was going to love the water too. Sr. Digital Marketing Manager for a top national home furnishings retailer. I love my job and being a working mom. Old love letters that Mark wrote me over the years as well as movie and music ticket stubs (Sufjan Stevens was a favorite!) and old plane tickets (from our around the world trip). Plus, my favorite pictures of Jonas. A collection of my favorite things. We jump in the car and drive to the beach. The boys bring their surfboards, Goose (our bulldog) digs rocks by the beach and I just sit and watch my little family. I love to give Jonas kisses. He is at a very playful age and says to me all the time, “Mommy, today is no kisses day. Sorry.” And he laughs. And I run after him and give him sooooo many kisses and he just laughs and laughs. I love those moments. The other day he takes a package puts it in our mailbox and tells me, “Mommy, something came in the mail for me.” He then opens the package and I realize he had made and shipped himself a kite. Jonas then says, “Grandma sent it to me”. I love to see where his imagination takes him. When I was a teenager I always thought that by 35 I would be a mom of three kids. 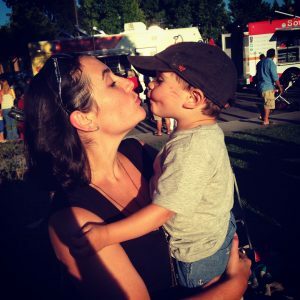 My path into motherhood was a lot more complicated than I ever imagined it to be because I got sick and hospitalized 3 times in the last 8 years. I never thought about getting sick when I was young. I was unstoppable until I wasn’t. My life looks very different than what I imagined it to be. But it’s more fulfilling. Has more depth. And I am so grateful to be here today. I never take that for granted. I believe we are all interconnected human beings with a string attached to our souls. I believe in kindness and resilience. And in God. Very much. I used to hate running but now I go 3 to 4 times a week. We live near a reservoir so I take my music and off I go. It’s time for me where I can recharge. On most of my runs there is a thought that stops me mid song. I take out my notepad on my phone and jot down that thought, that memory, that thank you that I don’t want to forget about. It’s my modern journal. I have hundreds of notes on my phone that I don’t ever want to lose. Jonas always comes first for us. That’s just the reality of our relationship. At the same time, Mark and I have so much fun together. Last year we went to a music festival without Jonas and listened to amazing artists (Florence + The Machine, The Lumineers, Red Hot Chili Peppers) for three days straight. We totally got pampered and spoiled but it’s important to always make new memories with your spouse. I was a planner growing up. After I got sick I realizedthat so much of life is out of our control. Like getting sick. It’s about accepting where we are at this moment even if it’s not where we want to be. You are so much stronger and braver than you thought you could ever be. Don’t give up, beautiful girl. That in one’s lifetime you will see your kids go through so many difficult times and you can’t always take thepain away. There is so much unknown regardless of all the planning and love that goes into raising a child. That scares me. A lot. But that is when Faith comes in. I wrote Jonas a letter for when he is older that didn’t make it into the book. I want to share an excerpt with you. For more information on this family.